Hello my lovelies! 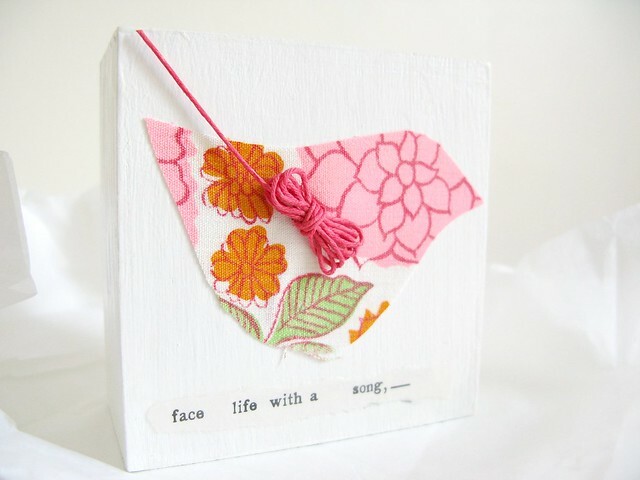 I'm really excited about sharing this Etsy fave with you today. Since the very moment I discovered the blog Red or Gray, many moons ago I might add, I have been completely smitten with Elaine Kean's beautiful minimalist work. Everything from her simple bird mobiles and garlands, to her collaged cards and twine wrapped stones. I am constantly mesmerised by her elegant use of simple textures and patterns, paper and fabric, meaningful words and phrases alongside beautiful natural elements such as stones and twigs. 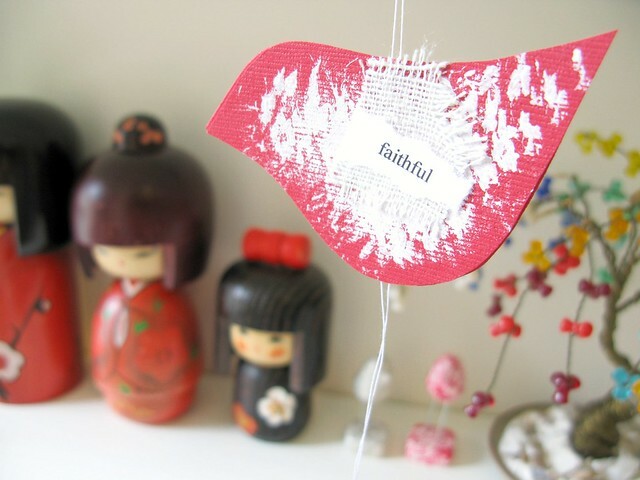 Elaine was so kind as to fill my parcel with a few other wee treats including the piece of fabric the woodblock bird was cut from and one of her gorgeous red 'faithful' birds... I have a wee project planned for this snippet of fabric but I am going to save that for the next time I feel I need a wee bit of cheer in my day. Inspiring and beautiful blog :) I`m a new follower from Bergen, Norway. I loved these birds. 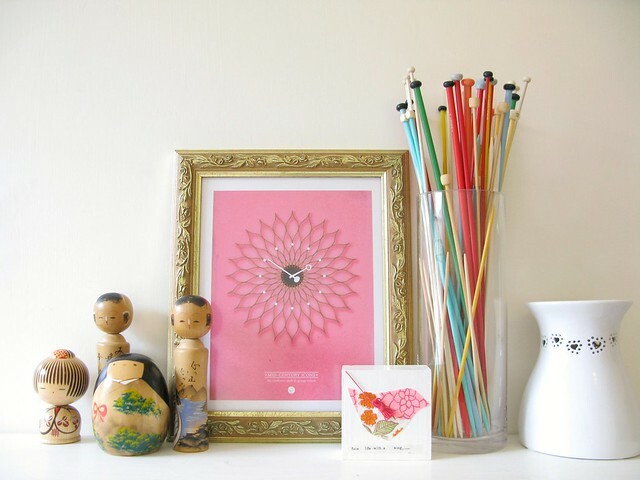 They are very cute and I also love this sunflower clock print. another cool recommendation - I am clicking as we speak! That little faithful bird is so cute! I'll definitely have to take a look at Elaine's blog. happy sunday to you & your wee man! Such a lovely vignette you made! 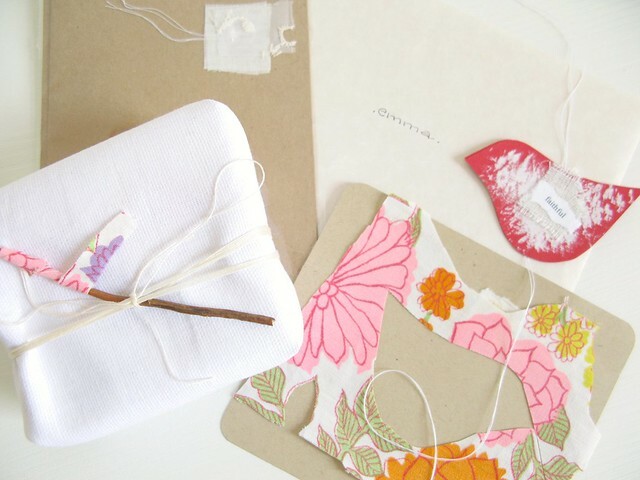 Lucky you to have received this adorable card + faithful bird + piece of fabric, together with the print you ordered! All wrapped so super super pretty! Since I'm here leaving you a little note, I'd like to congratulate you for being featured in the latest issue of Vogue magazine & the amazing feature on decor8 about your stunning colour moodboards! I love them so much + was glad to see a few of my favorite included.